Welcome to Edgewater Condominiums in Gulf Shores Alabama! Here, Emerald Coast by Owner is pleased to offer you numerous condos just along the coast. Our condos are equipped with not only the convenience of Edgewater's location, but a luxury and elegance that'll make you want to stay there forever. Yes, there's a beach just a hundred feet away if that, the waters are blue, the sky is clear, and the sand is white. Our gorgeous beach is not all we've got to offer however, great food and fun are our expertise! The Alabama Gulf Coast Zoo is a very popular attraction that is full of life and can be a blast for everyone! Gulf State Park is a park on the beach where you can participate in plenty of activities such as fishing, boat tours, paddle boarding, and much more! When you're done on the beach and having a blast, there's plenty of food to grab around the area! Bahama Bob's Beachside Cafe is a fantastic spot specializing in seafood just along the coast. Also, we highly recommend the West Beach Grille, a lively scene full of energy serving seafood and wings, a delicious eat you won't want to miss. 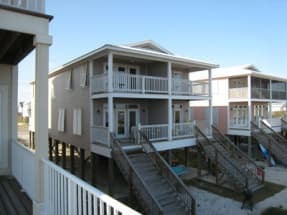 Emerald Coast by Owner is pleased to bring you the best Vacation Rental Properties by Owner in Edgewater, Gulf Shores. Be sure to contact the property owners directly by clicking the email owner button found on each listing. Booking direct with the property owner allows you to get answers to your questions before you book. Book online today with ECBYO.